A small dark, graceful tern of freshwater marshes and lakes. These birds breed in the upper Midwest, Great Lakes area, and southern Canada while wintering on the northerner coast of South American and the Pacific coast of Mexico. 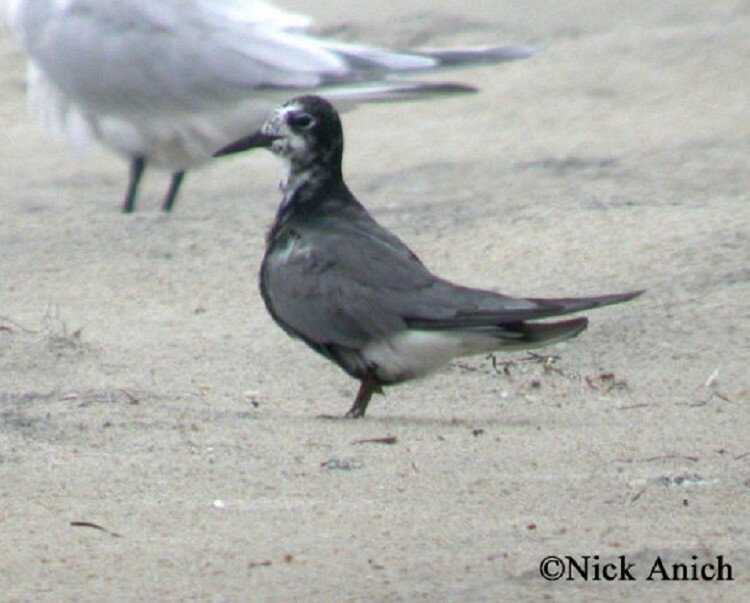 Black terns are readily identified in spring when they are in their brilliant black plumage, and in fall with their buoyant, bouncy and erratic flight with deep wingbeats and mottled black and white plumage. Description: Compact, with short square tail, broad wings and small black bill. Distinguishable by dark black head and neck in breeding plumage, dark gray upperparts, dark gray underparts and dark red legs and feet. Sexes similar in plumage. Juveniles and nonbreeding birds have dark ear spot and partial cap, pale underparts with dark patch on breast. Habitat: Frequents freshwater lakes, rivers, and other interior wetlands during spring and fall migration. In winter black terns are largely marine mostly staying within 30 km of land but have been known to venture out further in search of food. Nesting and reproduction: Black tern has never been known to nest in Tennessee. Status in Tennessee: Annual, regular, and locally common across the western half of the state, but can occur in east Tennessee in small numbers. Best places to see in Tennessee: Old Hickory Lake (May), Percy Priest Lake (August), Tennessee NWR - Duck River Unit (August), and the Mississippi River (any and all viewing areas) in late April through May and in August. Nicholson, C. P. 1997. Atlas of Breeding Birds of Tennessee. Univ. of TN Press, Knoxville, TN. Robinson J. C. 1990. An Annotated Checklist of the Birds of Tennessee. Univ. of TN Press, Knoxville, TN. Sibley, D. A. 2000. The Sibley Guide to Birds. A. A. Knopf, New York, NY.